I don't know about you, but this time of year makes me want to jet off to the likes of Lapland or the French Alps for a real dose of wintry weather and a proper taste of Christmas. Like most people, I love trips abroad and travelling is one of the things that you really can't put a price on. As a beauty blogger, it kind of goes without saying that one of my favourite aspects of going abroad has got to be the joy that Duty Free brings. Tax-free beauty goodies, you say?! I'm there. I love nothing more than spending those somewhat tedious sleepy hours before boarding in the beauty hall of an airport, adding more and more gorgeous beauty products into my basket. I can't resist a good deal, and with all the amazing brands situated in the halls of World Duty Free, I'm spoilt for choice. 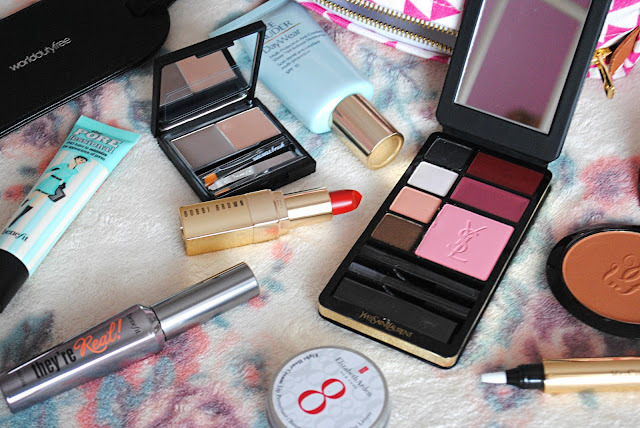 I'm talking YSL, Clarins, Estee Lauder, Bobbi Brown and Guerlain, to name a few. 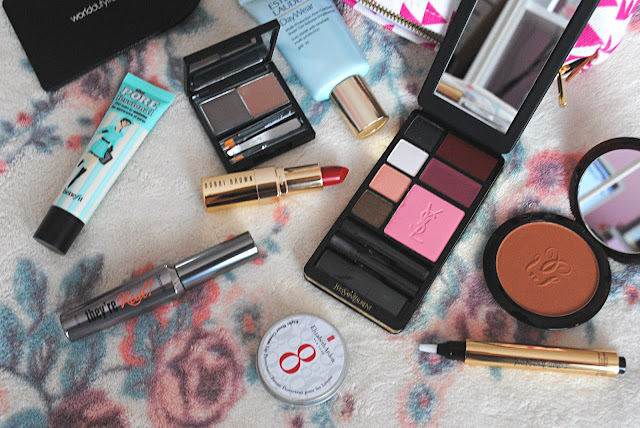 Whilst I love my drugstore beauty picks, I don't think there is anything better than treating yourself to a bit of premium makeup, at less-than-premium prices! So, when I was recently asked by the lovely people at World Duty Free to take part in their 'Selfie Challenge', I jumped at the chance. The challenge basically involves using lots of gorgeous goodies from World Duty Free to create the ultimate selfie, perfect for when you're taking snaps of yourself jet-setting abroad, and instagramming them to your heart's content. The kit included a plethora of fantastic beauty products, including Benefit faves They're Real, Browzings and Porefessional, Estee Lauder Day Wear, a gorgeous Guerlain bronzer, stunning red lipstick from Bobbi Brown in the shade 'Old Hollywood' (perfect for the festive season), Elizabeth Arden 8 Hour Lip Protectant, and an absolutely beautiful palette from YSL, exclusive to World Duty Free, as well as their signature Touche Eclat. All of the items featured in the kit are seriously amazing, and are most definitely essentials for anyone hoping to create the perfect selfie! I used all the products to create the look above, and I absolutely love the look I created using my selfie kit. I'm a big fan of red lips and I'm head over heels for this Bobbi Brown shade, which is so perfect for Christmas. The YSL palette is literally so stunning and I used it for both my eyes and my cheeks and adore how it turned out. 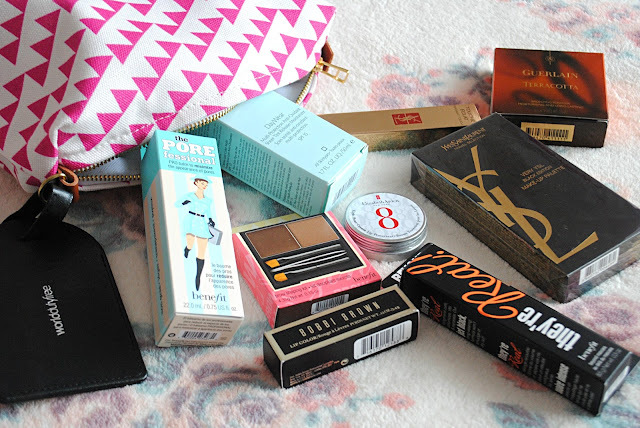 The Benefit products are firm favourites of mine anyway, and I definitely think they are all essential if you're looking to create a flawless selfie. 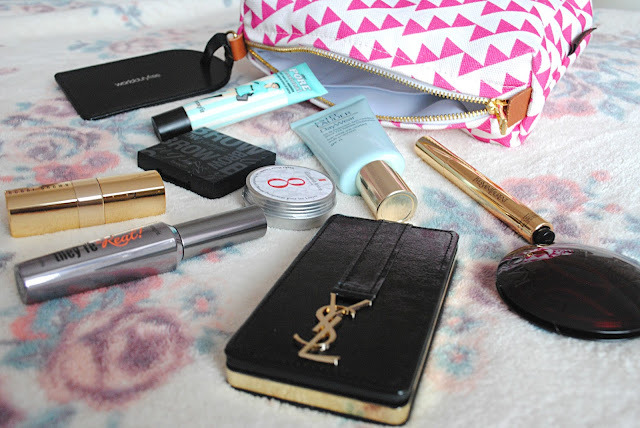 I'm amazed at YSL's Touche Eclat (believe it or not, I've never tried this before! ), love how smooth the Elizabeth Arden Lip Protectant made my lips, and can't get over what a perfect shade the Guerlain bronzer is. I adore absolutely everything I got and I want to say a massive thank you to World Duty Free for sending me these goodies, they're amazing!